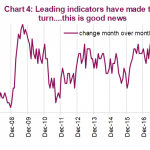 The economy is heading towards the sweet spot for the consumer as gas prices are declining and wage growth is accelerating. Real hourly wage growth was 0.7% in October. This improvement in the health of the consumer explains why Wal-Mart had same store sales growth of 3.4% in Q3 which beat estimates for 3.1%. The firm raised full year same store sales growth guidance from “about 3% growth” to “at least 3% growth.” Wal-Mart expects a strong holiday season from the consumer. In this article, we’ll discuss the October CPI report. It looks like core inflation may be peaking. Month over month headline CPI growth was 0.3% which met estimates and was above the 0.1% growth in September. 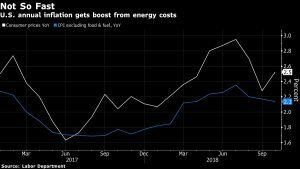 The Bloomberg chart below shows year over year inflation accelerated from 2.3% to 2.5% which met estimates. Energy drove the difference between headline inflation and core inflation. On a month over month basis, energy was up 2.4% and gas was up 3%. On a year over year basis, energy was up 8.9%. That won’t be the case in November as oil prices have plummeted. 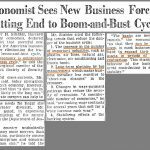 Headline inflation should fall, all else being equal. Without food and energy, CPI was 0.2% month over month which met estimates and was up from 0.1% last month. Year over year core inflation decelerated from 2.2% to 2.1% which missed estimates for 2.2%. That occurred because last year core inflation increased from September to October. The comparison gets easier in November and then progressively harder in the following months. Food inflation remained very low as it was down 0.1% month over month and up 1.2% year over year. Medical services inflation was up 0.2% month over month and 1.9% year over year. Physician and hospital services were flat monthly. New vehicle prices were down 0.2% monthly for the second straight decline, while used car prices were up 2.6% after falling 3% monthly. Because oil prices prevented real wage growth from spiking, October real wage growth was just the beginning of what is to come. As you can see from the chart on the right, Nordea’s leading wage indicator, which has a good track record, shows the ECI wages and salaries index for private workers should accelerate to 3.5% growth next year. The chart on the left shows a trend model for headline CPI if the U.S. dollar strengthens and Brent oil stays unchanged. It expects headline CPI to fall to 1%. These estimates are great for the consumer. One challenge is part of the reason the dollar is so strong is the Fed is raising rates. If the Fed continues to raise rates, the economy could weaken which would weaken the labor market and wage growth. If the Fed doesn’t raise rates, then the dollar could fall which would also push up oil prices a bit. The positive scenario for 2019 is all about the Fed threading the needle with monetary policy. It’s highly likely real wage growth will be strong in November, but that’s a given. Investors are looking towards the future not the present. The Fed follows PCE inflation the closest, which is why it is such an important report for investors. Because it comes out almost one month after the report period ends, we have a very good idea where it will show inflation to be. 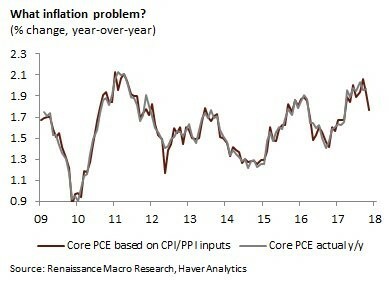 The chart below shows Renaissance Macro’s prediction for core PCE based on inputs from the CPI and PPI reports. It is highly accurate. As you can see, the estimate for core PCE is 1.8%. 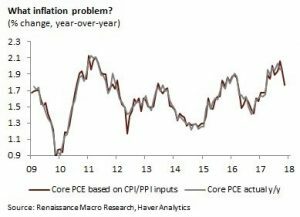 According to Renaissance Macro, because the CPI and PCE treat medical care services inflation differently, core PCE will be below core CPI. This dynamic is usually the case. That means core PCE will be back below the Fed’s target. It begs the question if further rate hikes are necessary. The Fed funds futures are right on the cusp of predicting a hike in December because the odds are near 70%. The Fed doesn’t hike when the chances are below 70%. Anything is possible with Powell, but it’s still worth watching. Housing prices are the biggest component of inflation metrics. In the CPI report, rent was up 0.2% monthly and owners’ equivalent rent was up 0.3%. On a year over year basis, housing was up 3.2%. As we have been discussing in our articles, the housing market has seen weakening growth in the past few months because prices are unaffordable. If housing price growth slows, it will have a big impact on inflation. Even with housing outperforming inflation this cycle, core inflation has been below 2% for much of the cycle. If oil and housing start to weigh on inflation, it will crater. The chart on the right shows the net percentage of banks reporting stronger demand for mortgages is the weakest since 2011. Existing home sales are also declining. 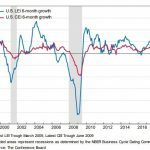 The chart on the left shows the worries about overall economic growth are rational as loan demand for commercial and industrial loans is weakening and growth in business equipment investment growth is slowing. 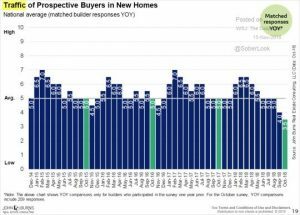 The chart below is a survey of 209 home builders who were asked about traffic from prospective home buyers in new homes. As you can see from the John Burns survey, year over year growth in October was only 3.5% which fell from 5% last year and 4% in September. Traffic growth is slowing and the net percentage of banks saying there is stronger demand for mortgages is negative. These are bad signs for the housing market. Even with jobless claims near the cycle low and consumer sentiment near the cycle high, consumers don’t have interest in buying homes at these prices. If home price growth slows in the next few months, inflation will crater. It’s certainly easier to follow the U.S. housing market than oil which is highly volatile. In the near term, real wage growth will soar. However, stocks will only rally if the Fed is able to extend this expansion, possibly by becoming more dovish. Even a great holiday shopping season can’t save stocks if investors think 2019 will be weak. 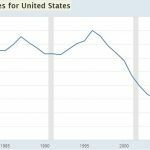 NextWho Didn’t Learn From 2008 Housing Crash?